Continuing our series on cool stuff that concert fans love to use, here’s a review of V-MODA Vibrato Remote Headphones. We always have fun testing out new gadgets and services that live music fans love to use at home or at the show. And I’ll start this review off by telling you that most of the gadgets and services we tell you about are ones we’ve enjoyed and it’s a pleasure to pass on the good news to you too. But sometimes the gadgets and services we test out don’t live up to the excitement as we hope they would. And unfortunately, like a bad concert or a lackluster album, the experience doesn’t live up to our expectations for many reasons. I tell you that to begin this review because my experience with the V-MODA Vibrato Remote Headphones (retail $129.00) started out good but unfortunately ended not so good. Who Created The V-MODA Headphones? I’m also told that Kolton’s vision for V-MODA is inspired by a passion for the omnipresent mingling of the fashion and music worlds. And knowing that the V-MODA line is also used by heavy hitters and high-profile artists like Crystal Method, Deadmau5, will.i.am, RUSKO, Paul Oakenfold, Paul Harris (Dirty Vegas), Eric Morillo, Major Lazer (Switch), Destructo, Sasha Grey and DJ Cobra, the bar for the V-MODA experience was pretty high. How Was the Listening Experience? At first the listening experience of the “V-MASQUE high-definition and 3D sound stage” technology was clear, crisp and completely immersive. The bass levels, highs and lows, and all the stylistic nuances of the different musical genres – rock, pop, dub step, drum ‘n bass, hip hop, jazz, folk and classical — I was listening to was rich and dynamic. I also like to listen to music while I’m working out and running, so I loved the way the detachable sport earhooks with “Active Flex technology” wrapped around my ears and helped keep the earbuds firmly in place, even when I was in a full sprint and moved my head around in all directions. I also used the headphones to check levels on-site while I was recording audio at the WBEZ Hip Hop Block Party and they worked great. I also dug the slick and compact leather carrying case, and the durable and stylish and custom designed Kevlar® reinforced fabric cables/cords and rugged 45° plug. I wasn’t crazy about the headphone cables when they got tangled up like similar headphone cables do, but it wasn’t really that big of deal. 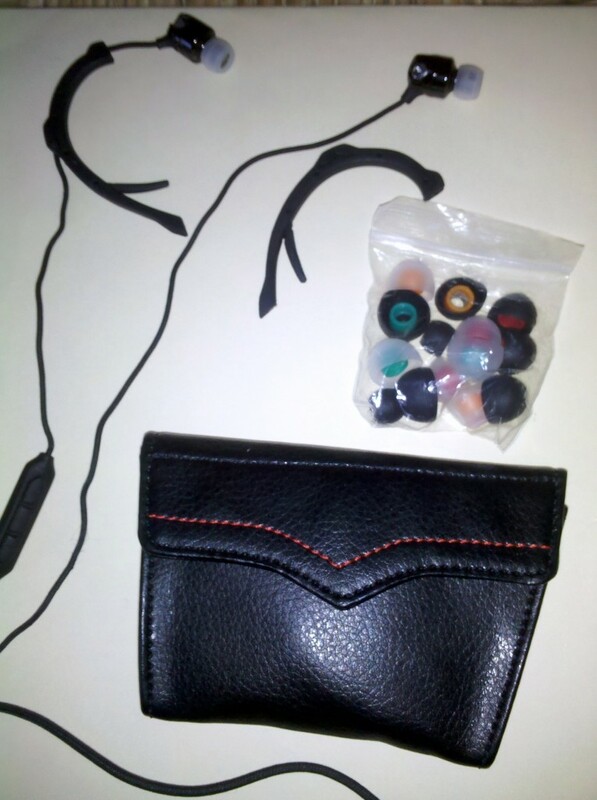 The various sizes of silicon earbud coverings adjusted nicely and fit comfortably to my ear. I always have a hard time finding the right fit with earbuds coverings but I was able to quickly find the right size and slipped these earbuds right in. Did They Stand the Test of Time? 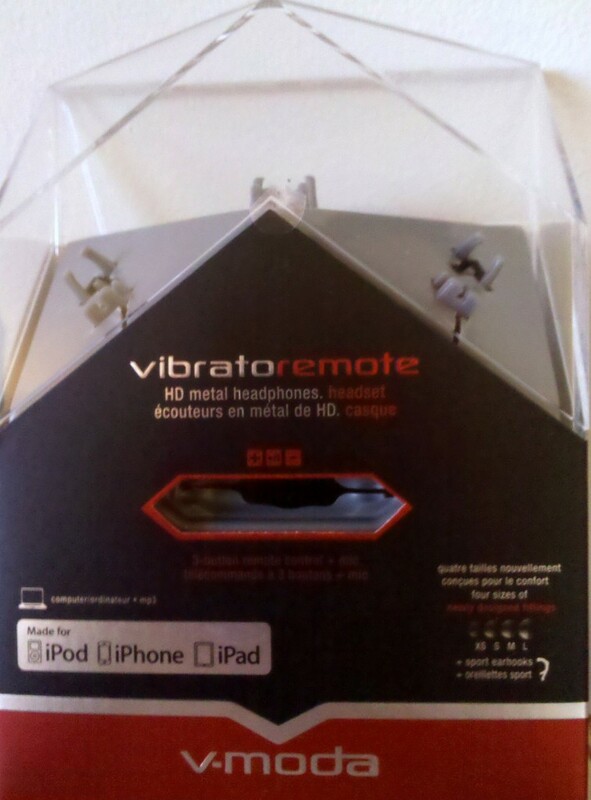 I waited awhile to right this review because I wanted to see how the V-MODA Vibrato Remote Headphones held up overtime. I know that bud headphones can get battered and worn and start to diminish in listening quality as you use them. So I wanted to see how these headphones would hold up for a few months. I didn’t want to just wear them for a month and write a review telling how great they are and then suggest you buy them only to have them crap out later. That said, as I started to write my initial review in early February, the headphones took a turn for the worst. First, the right ear bud began to fade. At first, I thought it was my ears, but then I did a right/left test in both ears, and sadly realized that it was the earbuds and not my ears. Eventually the failing right earbud got worse and completely stopped working. Sure, new gadgets aren’t perfect. Even the best ones fail and need to get replaced. But what really turned this review sour was the fact that when I reached out to my V-MODA contact to inquire about the broken set of headphones I didn’t hear back at all. In my email, I told her that I wanted to get a replacement and offer my readers an explanation and show that if the headphones did break that the customers could count on good customer service to take care of the issue and resolve it. On their website they do note that the headphones come with a Replay Replacement Program and a Two-year V-MODA premier warranty, but after my experience I’m sure how reliable that would be after not hearing back from them about my issues. I hope it doesn’t come to this but if I still don’t hear back from V-MODA, we might have to start a V-MODA complaints choir. 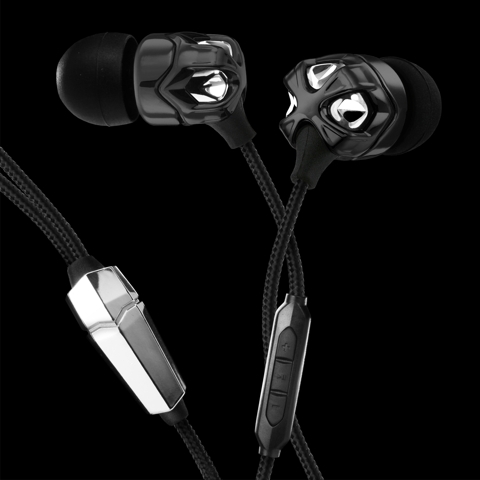 So considering the broken earphones and the lack of response from V-MODA in the customer service and PR department, I unfortunately have to suggest that you stay away from the V-MODA Vibrato Remote Headphones right now, and look to a different company when you want a new pair of headphones. That wraps up our review and if you’re interested, I’ve included the headphone specs below. Two months after posting this review I received an email from V-Moda’s new PR agency saying that they had read this review and wanted to send me a pair of new headphones for a second review. They also apologized for the lack of response to my previous emails, and they said that my first pair was most likely a defective pair. That said, they did send me a second pair of Vibratos which I received this week and have been using so I can provide a second review for you. And so far so good. I also did some more digging and found this on their FAQ page. q: One ear all of a sudden sounds quieter than the other. How can I resolve this issue? Remove the silicone fitting from the earpiece. Briskly blow into the earpiece. NOTE: Do not put your mouth around the earpiece, just near it. Try the above steps a couple times before calling support or returning your headset. It has been found that almost all customers who think they have a defect actually just need to clean or blow out their earpieces. I tried the above steps and the defective earbud still didn’t work. So I’ll continue to test out my second pair and see what happens. Again, I really really like the Vibrato Remote and I hope this new pair works. All this said, I would like to say that Vibrato has responded nicely to my unfortunately technical difficulties and based on the responses, resending of the new pair of earbuds, and troubleshooting tips I would recommend the Vibratos if you’re in the market for a new pair of high-quality earphones. And if you do have any issues I’m confident that V-Moda will work with you to make sure you get a working pair of earbuds. If you’ve tried out a pair of V-MODA headphones, let us know how your experience was. And we’d also like to know…what are your headphones of choice? How High Is Your Indie-Rock and Pop Music IQ? Concert Fan Video Journal: Good Times at Schubas with Live Music Fans!